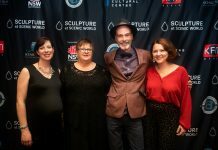 CURATOR, writer and art historian Sasha Grishin has always been mad about the colonial artist ST Gill and now in the National Library of Australia’s latest exhibition, “Australian Sketchbook: Colonial Life and the Art of ST Gill,” he has a chance to show the Australian public just why. 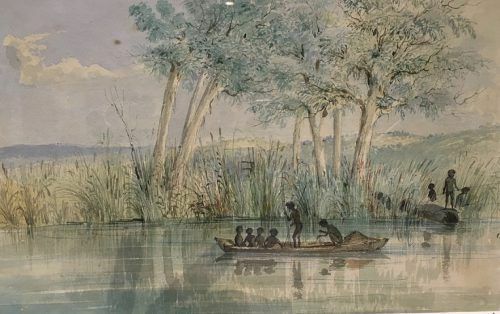 Yesterday at the library Grishin told assembled media just what was admired by the general public, who were very familiar with Gill’s paintings of Australian life in the 19th century, even if they mightn’t recognise his name. ST Gill has been vilified in our history, Grishin said and this exhibition would rehabilitate him. While the word “historic” was is his view overused, this was indeed an ‘historic occasion’, being the first retrospective exhibition of Gill ever held and the occasion to bring together two gentleman by the name of John Doyle. One of them, the writer, film-maker and entertainer (Roy Slaven) was on hand to assure us that he’d known Gill’s work all his life (though he didn’t realise it) and to help Grishin introduce the exhibition. 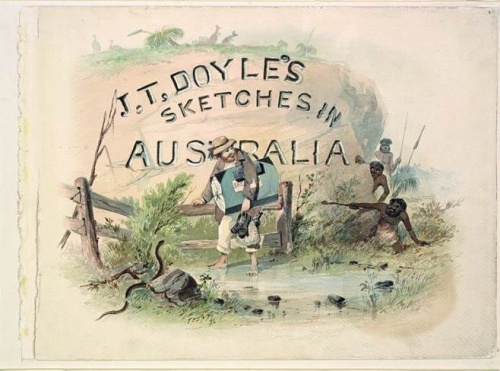 The other Doyle, we heard, was the charismatic lecturer, physician and entertainer John Thomas Doyle, who commissioned Gill back in the 19th century to produce a sketchbook which he took back to Ireland and published as his own. After in 1933, when it was gifted to the Mitchell Library in Sydney, scholars discovered that it was not Doyle’s work at all but Gill’s. The sketchbook forms the centrepiece of this comprehensive exhibition. In curating the show, Grishin has highlighted Gill’s reputation among his contemporaries for being the voice of conscience. 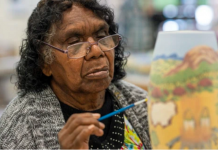 In the opening a part of the exhibition we see how he drew and painted Aboriginal Australians with a view to giving them a measure of dignity, way ahead of his time. He was also ahead of his time and trying to rewrite women back into history. As a “tree-hugger,” Grishin told us, he also foresaw the destruction of the Australian natural environment. Sounds familiar, even modern? According to Grishin that wasn’t not the only familiar aspect of the Gill story for, dismissed as a drunkard, (though he died of a heart attack on the steps of the Melbourne GPO) he fell afoul of racism and xenophobia in the 1850s, when politicians whipped up hatred of Chinese ‘boat people’ arriving to take work away from Australians. “Gill emerges as an advanced democratic socialist, that was a career-ending move,” Grishin argued. But as such, he invented a new breed of Homo sapiens, the Aussie digger, tough and resilient. He use the term “digger” well before it entered the common idiom. 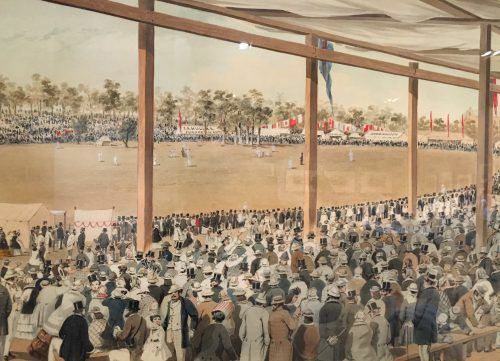 This comprehensive exhibition shows Gill’s work in South Australia, in Melbourne and in Sydney where he fled to live with a woman called Elizabeth for eight years, covering big sporting functions like cricket and the horse races. Tragically, it was a horse race that proved his undoing when he was forced to admit in court that he actually hadn’t been present at a race he captured in picture. It was sobering, Grishin concluded, to think that back in the 19th century, just as now, trying to make a living as an artist could be frustrating. Grishin’s exhibition demonstrates that to a tee. 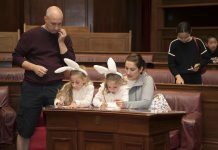 “Australian Sketchbook: Colonial Life and the Art of ST Gill,” Exhibition Gallery, National Library of Australia until Oct 16, 10.00am-5.00pm daily.